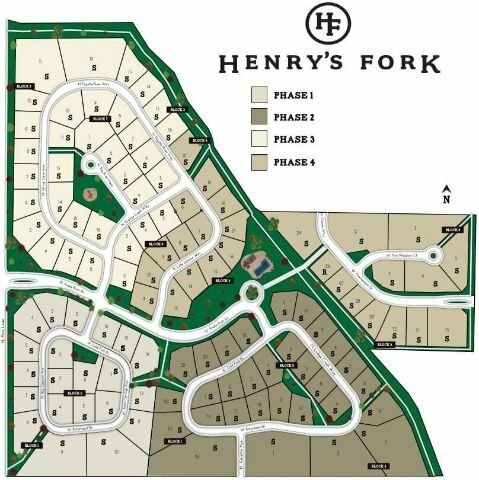 The Henry’s Fork subdivision is a new home community located in Eagle, Idaho. Fantastic views of the Foothills, wildlife, and generous open space lend a rustic feel to the community. Henry’s Fork homes for sale bring the country to the city. Only ten minutes away from Eagle’s first-class shopping, dining and schools. One of the most distinctive features of Henry’s Fork real estate is the size of the available building lots. Ranging in size from 0.3 acres to 2 acres – a luxury that is becoming rarer in many new construction communities. Learn more about Henry’s Fork real estate just below. Browse all new homes in Eagle or view the complete guide to new Eagle subdivisions. Homesites: 112 building lots over four phases ranging in size from 0.3 acres (13,070 sq ft) to 2 acres (87,120 sq ft). From Eagle Rd head west on W Floating Feather Rd. Turn right (north) on N Park Ln. Turn right (east) on W Snake River Dr to the Henry’s Fork subdivision. If you’re looking for astounding views in an extraordinary location, Henry’s Fork real estate is a great option. Please don’t hesitate to contact us online or call (208) 391-4466.